To the Editor: Much attention has recently been paid to the excessive hours worked by South African interns, with a commitment by the Department of Health to address the issue. However, there is still limited recognition of other stressors that influence the well-being and performance of interns. We undertook a study to identify the major causes of stress that affect interns, their stress-coping strategies, and factors that contributed to a sense of coping at three academic hospitals in Johannesburg. We also compared our findings with those of a similar study performed in the same settings two decades ago. During August 2005, interns at Chris Hani Baragwanath Hospital (CHBH), Johannesburg Hospital (JH) and the Helen Joseph/Coronation hospital complex (HJH/CH) (which are all affiliated to the University of the Witwatersrand, Johannesburg) were requested to complete an anonymous, self-administered, confidential questionnaire that assessed various aspects of their internship year. Of the 136 interns employed at the three hospitals (CHBH 60, JH 44, HJH/CH 32), 110 (81%) were randomly selected for study. Participation was voluntary, and ethical clearance was obtained from the Committee for Research in Human Subjects at the University of the Witwatersrand. A 62% (68/110) rate of response was obtained. The mean (±SD) age of participants was 25.1±1.6 years, 54% were female, and 79% were single. Interns qualified at a variety of universities (39% Wits, 16% MEDUNSA, 16% UCT, 15% Pretoria, 13% KwaZulu-Natal, 3% Free State, and 2% Walter Sisulu). Twenty-seven participants (40%) rated internship as being 'significantly' or 'overwhelmingly' stressful. 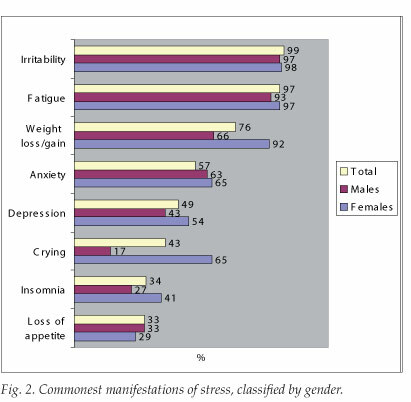 There were no gender, marital status, hospital-base or department-related differences in stress levels. Graduates from the University of the Witwatersrand had significantly lower stress scores than graduates from other universities (p<0.01). Heavy workloads and long work hours were the foremost causes of stress, with HIV/AIDS-related concerns, lack or disrepair of equipment, staff relationships, and perceived quality of care issues also featuring prominently (Fig. 1). The average intern was responsible for 20.4 inpatients at any one time, worked a mean (±SD) of 70.1±18.9 hours a week (range 40 - 150 hours), and slept for 1.9±1.6 hours during an intake. There were no significant gender or marital status differences for these variables. The number of hours worked was described as 'demanding' to 'very demanding' by 91% of the sample. An alarming number of interns (69%) reported being directly exposed to HIV via a needle-stick injury or mucosal splash. Anxiety associated with such exposures was considered 'moderate' by 34%, 'significant' by 45% and 'overwhelming' by 21% of participants. Access to and provision of post-exposure prophylaxis was deemed 'satisfactory' to 'good' by 70% of the sample, while availability of psychological support was considered to be 'poor' or 'very poor' by the same percentage. Two-thirds (63%) of interns considered availability of basic supplies (e.g. gloves, drip stands, needles) to be 'poor' to 'very poor', and 59% expressed similar sentiments concerning the routine maintenance of basic medical equipment. Participants rated the performance of their fellow interns positively (49% 'good') and were content with nursing staff (79% 'satisfactory' to 'good'). Most interns were happy with the overall quality of teaching, with 58% considering teaching 'satisfactory' to 'good'. However, the quantity of teaching exposure was felt to be insufficient (rated by 53% as 'poor' to 'very poor'). Fig. 2 summarises the most common manifestations of stress. These were considered to affect their functioning and personal sense of well-being to a 'moderate' to 'significant' degree by 81% of the interns. More than half (54%) admitted to being depressed, and over a third suffered from insomnia or appetite loss. Although females reported more somatic manifestations, there was no statistical difference in the extent to which such manifestations affected their functioning compared with males. Females were more likely to report recent weight changes (odds ratio (OR) 5.7 (95% CI 1.2 - 29.8), p=0.01) and crying (OR 3.8 (95% CI 1.1 - 14.4), p=0.02) and were more likely to acknowledge the negative effects of stress on their personal sense of well-being (p<0.01). Despite stress being rated 'moderate' to 'significant' by 93%, the majority (91%) of interns believed that they were coping with their internship. Interns who considered themselves to be 'coping', rated their stress levels significantly lower than those who claimed not to be coping (p<0.01). The top three stress-relievers were taking vacations, the support of family, and friends (Fig. 3). Alcohol use was relatively widespread (with 20 interns admitting to its use as a stress reliever) but it ranked low as a stress reliever. 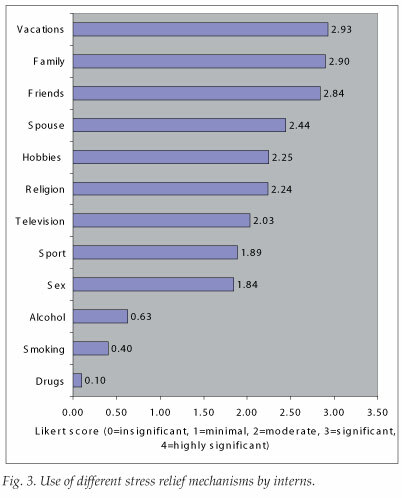 The consumption of cigarettes and drugs as stress relief mechanisms was infrequent (by 11 and 3 interns respectively). The study produced expected, surprising, disconcerting, and reassuring findings. Levels of psychological distress remain high among interns in Johannesburg, despite recent initiatives to improve the work environment. Difficult working conditions, particularly long work hours and heavy workloads, is the defining feature of internship and was predictably identified as the most important stressor. HIV/AIDS imposes a substantial toll on interns, both physically and psychologically. The high number of occupational exposures is disturbing, and is similar to a previous report.1 Shortages of and poor maintenance standards of essential equipment were among the top contributors to stress. Because most of the stress literature emanates from better-resourced settings, these are not discussed in the literature. However, doctors working in under-resourced settings would easily recognise why they rank highly as sources of stress. Not unexpectedly, female interns reported more somatic manifestations, including weight changes and crying, and felt that their personal sense of well-being had been compromised. A call for an urgent review of intern working conditions, for better protection against occupational HIV or for better stress support mechanisms, is likely to fall on deaf ears. We propose a more pragmatic approach locally for senior doctors and other staff to be continuously sensitised to intern stress (by their junior colleagues, if necessary - by presenting this and other similar literature at a journal club, for instance!) and its deleterious effect on the health of the practitioner and patient care. A demonstrably more humane and caring attitude towards junior staff should be an important performance indicator for senior doctors and hospital administrators. Finally, clinical units hoping to entice junior staff to stay on after internship and community service would be well advised to prioritise improvements in both the learning and personal caring environment. Offering supportive and reflective opportunities may offer the best prospects for reducing stress, creating enthusiasm for learning, encouraging compassion for patients, and promoting future well-being. This study was planned and undertaken (by GS and MJvR) as part of a MB BCh V student research project at the University of the Witwatersrand, Johannesburg in 2005. The authors thank medical students S Khan, E Gangat, S Abram, M Ansarmeah, S Hartley, M Mansoor, A van Blydenstein and R T Richardson for their assistance in data collection and compiling the original student report.